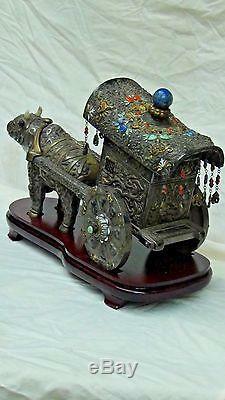 ANTIQUE CHINESE ELABORATE SILVER AND GILT WEDDING OX CART WITH TRACES AND OX, DECORATED IN RELIEF WITH DRAGONS, BATS, FU-LIONS, DEER AND POMEGRANATES, INLAID WITH CORAL, TURQUOISE, LAPIS AND MOP. 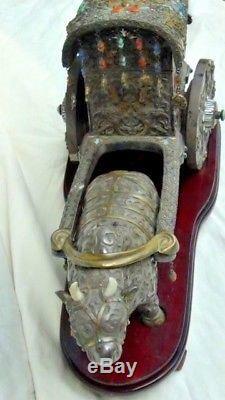 A SILVER PATINATED OX, WITH A RAISED SCROLL DESIGN, GILT HARNESS AND TAIL, TURQUOIS EYES AND BONE HORNS, PULLS THE CART. THE CART ALSO SERVES AS A TRINKET BOX, THE COVER WITH THE LAPIS COBOCHON FINIAL LIFTS OFF. THE WHEELS HAVE 8 SPOKES EACH TOPPED BY A BAT;DOUBLE GOURD OF HAPPINESS IS BETWEEN SPOKES. SYMBOLIC BUTTERFLIES SUSPENDED FROM SEMI-PRECIOUS DANGLES HANG FROM CART ROOF. CART AND OX REST ON FITTED WOOD STAND. 20"L x 15"H x 9W. 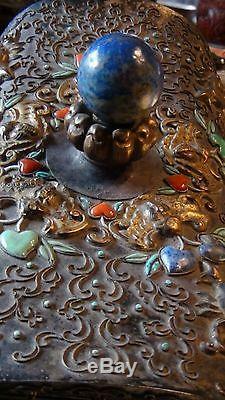 The item "ANTIQUE 19c CHINESE SILVER&GILT WEDDING OX CARTDECORATED WithDRAGONS, BATS, FU-LIONS" is in sale since Friday, March 24, 2017. This item is in the category "Antiques\Asian Antiques\China\Other Chinese Antiques". The seller is "silkboxing" and is located in Renton, Washington. This item can be shipped worldwide.